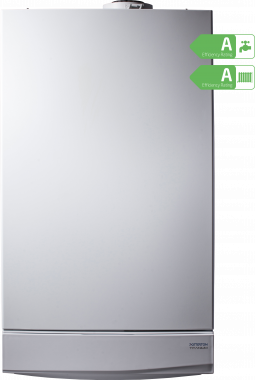 The Titanium Combi gas boiler is a condensing wall mounted unit, made and manufactured by Potterton. This unit comes with an output rating of 40kW and an efficiency rating of 91.1% making it an A rated boiler. It is a highly efficient boiler, that is ultra powerful coming with a wide range of output ratings such as the 24kW, 28kW, 33kW and 40kW so you can be sure there is a boiler to fit you and your homes needs! With the 40kW boiler being the most powerful boiler, coming with instant hot water and heating delivery on demand, this unit has been said to be a family favorite. It comes with a wide range of features to make it an extremely reliable boiler, such as the 24 hour mechanical clock and filling loop that is fitted as standard - with this featuring helping to save time on the installation. As well as this it comes with a flue option of up to 20 metres helping to provide your boiler with flexibility in where it is able to be placed. With this unit being Energy Saving Trust endorsed you can be sure that you are getting a reliable boiler that meets the highest and strictest product and energy performance criteria. With this unit comes seven years warranty helping to give you peace of mind that you have purchased the most reliable boiler.